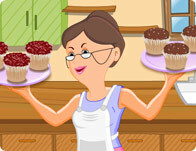 Join dear old granny for a delicious kitchen adventure in making yummy cheese cake muffins! Rich in flavor, moist in texture and topped with cherries this is one home made desert you can`t beat with a bat! This spicy Mex Tex casserole is easy to make and is so delicious! Add the spices, the chicken, and finally the baked pita bread and cheddar cheese to give your dinner that gooey, crunchy taste! The only thing better then a delicious old school sandwich is a neo future ice cream, cookie, candy and fruit sandwich. Filled with any flavor cream you want and topped with delicious sprinkles and candies. You love it. Looking for a delicious dessert? Well, why don't you make your own?! Top off a sponge cake with syrup and fresh fruit, and use a donut to create a unique look to your tasty pastry dessert! Lily's caramel popcorn might take a while to make, but this light chocolatey treat is absolutely worth it! Try to put together a tasty trio of almonds, walnuts, and popcorn all covered in caramel and chocolate! When you get a chance, bring in the new spring season with some incredible cake recipes and a pretty flower cake that shows off your cooking and pastry decorating skills! Show off your decoration skills and create the absolute best lollipop candy you can. Remember that not all lollipops need to be made of hard sugar. Make it a cake pop and decorate it with sprinkles!